She is a woman of substance, she possesses a depth of personality and character; is consistent, has more to her than meets the eye! An educationist who is endowed with a razor sharp intellect and a vast repertoire of knowledge; a woman of power, a woman of positive influence; she belongs to that noble galaxy of great leaders who wield extraordinary power; her vision goes far beyond her own school and embraces the entire human race. A charismatic visionary, she has worked with unmitigated zeal and her achievements have cast a permanent imprint on the spiralling success story of Somerville School NOIDA. 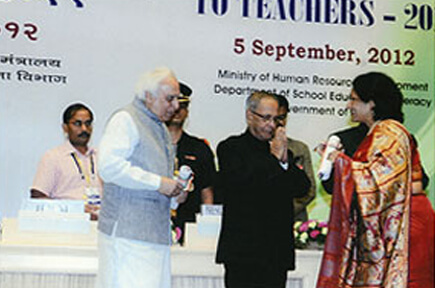 Mrs Arul Raj joined Somerville School, NOIDA as TGT Social Studies in 1993. Soon she got promoted to PGT Economics. She went on to become the Headmistress in October 1998 and took over as the Principal in April 2006. Under her dynamic stewardship the school has grown and made a place for itself not only among the top schools of NOIDA, but also of Delhi. The leadership skills that she has shown stem from her focus on a definite purpose, discipline, a clear-cut perception, and her belief systems. As the Principal of the school she plays a vital and multifaceted role in setting positive direction for the school, making it a productive workplace for teachers and a vibrant learning place for children. The role of a Principal has been redefined to embrace a staggering array of professional tasks and competencies - and Mrs Arul Raj has done full justice to it by playing the role of an educational visionary, instructional and curriculum leader, assessment expert, disciplinarian, community builder. She has worn many hats, being a manager, administrator, instructional leader and curriculum leader at different points in a day. In this balancing act of having to juggle between these various roles she has come out with flying colours – being awarded the Teacher’s Award for 2011. In an endeavour to appreciate the students’ desire to excel and encourage them for the effort they make to develop skills, garner knowledge and achieve success,the school has instituted many awards and trophies. Certificates of Merit and Gold, Silver and Bronze medals are given to the winners of Athletic events.